Marine researchers are searching for an answer to the mysterious disappearance of Mary Lee, a popular great white shark whose movements along the Atlantic coast have been tracked for the past five years. The shark is one of more than 300 fitted with a GPS device by research group OCEARCH, a non-profit dedicated to the study, safety and tracking of sharks. 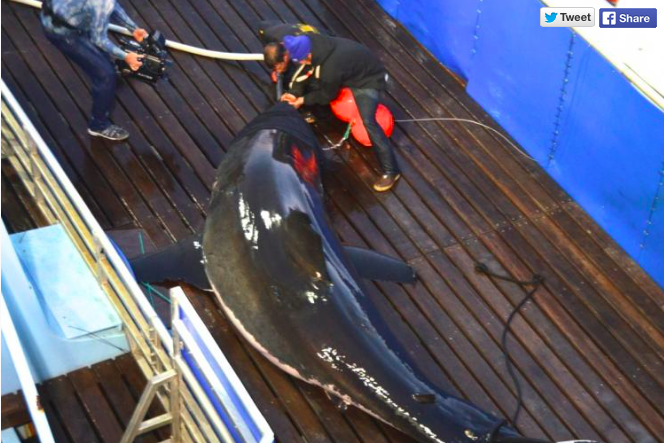 Mary Lee became a favorite of the public because of her active social media presence on Twitter, where fans tell jokes and provide updates on her location throughout the year. At more than 20 years old, Mary Lee weighs in around 3,456 pounds and stretches approximately 16 feet in length. Since great whites often can live into their sixties and beyond. OCEARCH lost contact with Mary Lee after her last ping in June, when she appeared about 10 miles off the coast of Brigantine and in the vicinity of Cape May County. Researchers record a ping whenever a shark's dorsal fin breaks the surface of the water. Given the time of year and the annual predictability of Mary Lee's travels, researchers suspect she is probably off the Atlantic coast near the border of Georgia and Florida, according to the Florida Times-Union. OCEARCH founding chairman Chris Fischer said it's possible that the battery on Mary Lee's transmitter died due to the frequency of her pings and the natural life cycle of the equipment. While researchers could encounter Mary Lee on another expedition as they did near Massachusetts in September 2012, Fischer seems ready to concede that we've likely seen the last of her.